In addition, Corporate Social Review aims to become a reference guide of values and ethics by recipients throughout the years, thereby giving advertisers a continued presence with their target market and increasing investment opportunities. Contribute directly to the distribution of the publication so that identified individuals and valued clients become recipients of the publication ensuring your message directly penetrates your target market. 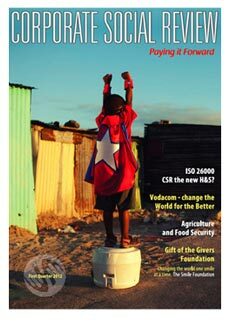 • Exposure for other non-profits: The magazine promotes the activities and offerings of organisations working towards the common good, thus enhancing investment opportunities through shared/common values. • Current and Relevant News and Information: Delivering comprehensive content and diverse marketing channels. • Advertising supported by editorial availability ensuring clients have the benefit of both formats as to maximise marketing potential. • Targeted advertising exposure for CSI initiatives, government projects, environmental and sustainability information including all businesses with products and services on offer. • Awareness. The magazine addresses the issues of marginalization and vulnerability, whether caused by poverty, disability, illness, gender, age, race or geographic location, and highlights the way in which all of our lives are affected. It does so in a manner that is meaningful to affluent, mainstream society, as well as to marginalized people. It gives each side of the divide a glimpse of the other and fosters empathy, tolerance and cooperation among all South Africans. Deciding to position your company as a leader in business by participating within the premium business-to-business publication would enhance reputations, effectively market products and services whilst highlighting commitment to Corporate Social Investment. Corporate Social Review is a corporate social responsibility (CSR) communication vehicle that adopts various media formats to allow all including executives, managers, researchers, consultants, academics and activists to track the Corporate Social Investment policies, initiatives and sustainability performance of major companies whilst remaining up to date with relevant news and information. We strive to integrate maximum exposure whilst maintaining budget without compromising on quality and provide products including hard, soft copy publications, online presence and networking ability which include services along: • Customised Client package – tailor-made to suit your objectives. • Range of cost-effective, high-quality comprehensive marketing packages. • Comprehensive range of multiple & loose advertisement inserts for any range of products & services. • Press Release and media communications. • Publicity for Events, Conferences, workshops and seminars.